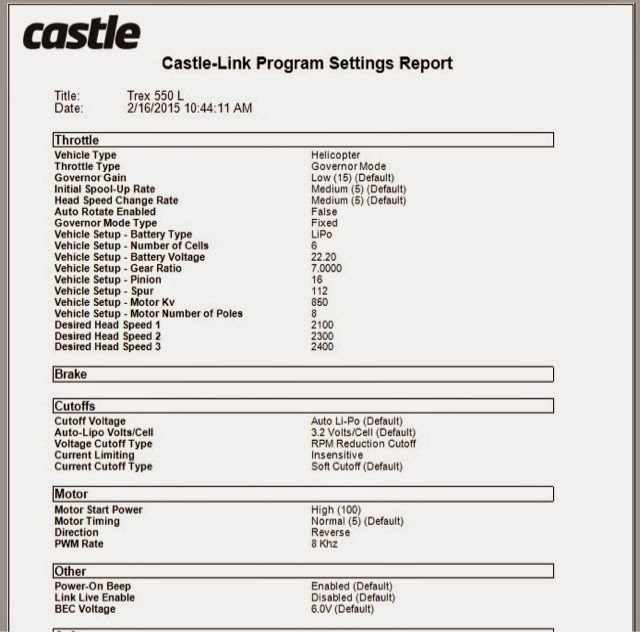 The settings was provided by Castle Creation by replying my email about how to set up the governor mode on the ESC Talon 90 for my Align 550L Dominator with the 730MX 850KV motor. 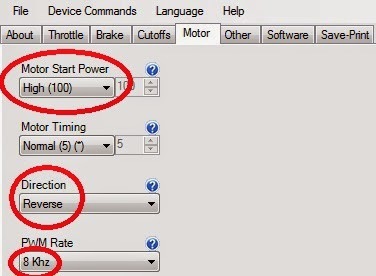 This is a recommended settings as a start, I personally run it on my 550L without any issue, and I changed the value for BEC from 6V to 8V as I like the high speed and torque on the high voltage brushless servos(BL815H , BL855H) come with the kit. The snap shots here below are the final settings of the Talon 90 on my 550L; parameters in red circles are what have been changed from default. Note the parameters "initial Spool-Up Rate"=5 and "Motor Start Power"=100; which makes the 703MX motor starts(spools up) smoothly without clogging(or cogging). PWM in 8kHz makes the motor not as hot as in 12kHz(default), so I prefer 8kHz even though I did not see any difference in flying. Set the "Voltage Cutoff Type" to "RPM Reduction Cutoff" is important as I still have enough power(75% output) to fly a while to find a appropriate place to land the heli. I will only have one chance to land the heli if it's in "Soft Cutoff" because the power to the motor is actually cutting off; I have to switch to auto rotation mode to land the heli immediately which is kind of risky.. Important Notice: Don't stay your stick at the highest pitch(like my +/-13 degrees) longer than 0.5 second or even shorter, otherwise the head speed will drop a lot and your heli will bog down. I usually pull back as soon as the highest pitch is reached, this short moment is enough to perform a hard stop during 3D flight, or makes your heli "launch" like a rocket suddenly from hovering; that makes your heli looks very agile and powerful. Any other comment is welcomed. Very interesting. I also have a 550L fitted with a Talon 90. Last weekend it "shut down" in what I think was a soft cutoff. I managed to auto the model OK but it sure wakes you up!! I had thought of changing some of the factory presets and your listing has confirmed that it should be OK. Thanks for posting this. This info is great! I have been flying my 550L Dominator ungoverned and ready to give it a try. Once I configure the Talon with the above info, how do I set my throttle curves on my radio (DX8)? Is it as follows? If you want the throttle values for your IDLE 2(I call it IDLE as I use Futaba radio) and IDLE 1 both the same, then your values are correct. I set the values for Normal & IDLE 1 10 points higher to cover the tolerance just in case. Yours should fine too as long as your radio is precise enough. I only use N for take-off and landing, so I think I should be fine. Steve, your IDLE 2 is 90 flat, which throttle output is actually the same as your IDLE 1, if that's what you want, that's fine then, or set IDLE 2 to 100 flat in order to get a different head speed from IDLE 1. Hmmm... I think the lighbulb just went off... is the following correct? 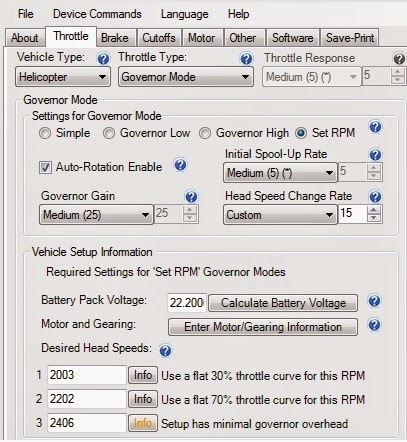 When using governor mode, the throttle values in the radio become "binary". That is, anything below a certain minimum (in this case, 30) tells the ESC to stop spinning the motor. Anything between 30 and 99 tells the ESC to run the motor at the Desired Headspeeds as defined on the Throttle tab. At 100, it tells the ESC to run full out. You're correct except the definition for the value 100. in the ESC, 30, 70, 100 just stand for 3 head speeds, you can define all of the 3 mode in the same head speed if you want. You can configure your 550L in 2000 RPM each for Normal, IDLE 1, IDLE 2, even though that makes no sense, but that's how the 3 numbers work. 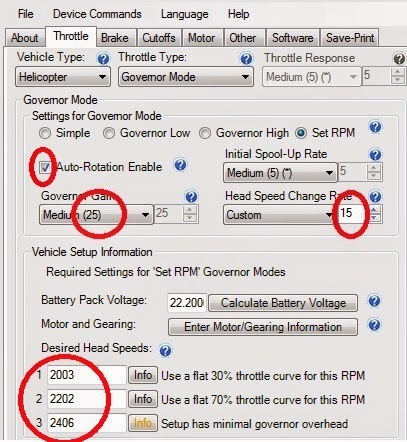 So in summary: in governor mode, the value 100 is for IDLE2, but is not necessary for 100% throttle output, depends on the head speed you define, and due to it's in governor mode, so the throttle output can't be 100% all the time(think about when the pitch is in zero degree, it needs relatively lower power to maintain the constant head speed). In simple, if you want a specific head speed for IDLE 2 and is different from IDLE 1 and NORMAL, value 100 is the only one number you can use. Brilliant bit of information, just setting up my brand new 550L, with exactly the sa,e set up. Saved me a lot of hours working things out. Good if you feel helpful. And let us know about how your 550L flies. Doesn't matter, as you won't be using the BEC power from your Talon 90. Remember if you use an external battery for all the electronics, DO isolate the Red center wire from the Talon 90, so your Talon 90 will not be trying to send power to rx or the GPRO(or whatever flybarless gyro). Hope this helps. What's that remote extender for ? 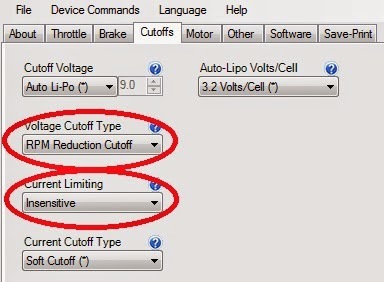 Can I also use these settings for a trex 500 pro dcf? You can use this settings in the same concept, but you have to modify some parameters which are different in between different helis such as the gear ratio, head speed, etc, so that your heli can work properly.